I'm really NOT a flowery or Soft Suede kind of girl. 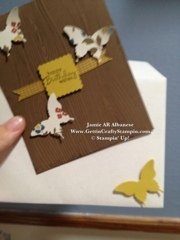 Buttttt I pulled out my color wheel, this Woodgrain background stamp and my Designer Series Paper chart. It alllll pulled together with our new Summer Starfruit paper and Stitched ribbon. The Comfort Cafe DSP is really lovely (in small doses, lol) with its vintage color palate and theme. 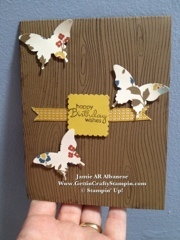 Here is Chocolate Chip ink stamped Woodgrain backdrop stamp. 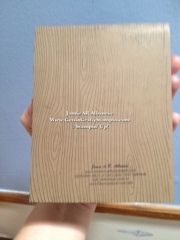 (pg 127 of the 2012 Idea Book). 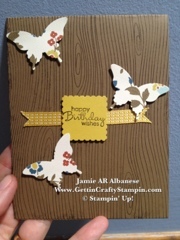 I then punched out these butterflies from the Comfort Cafe DSP and adhered them with Stampin' Dimensional. I used Snail adhesive to hold the ribbon then the Dimensional to make the Petite Pairs sentiment Pop up. 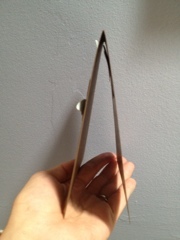 The Postage punch really fits its size to a T.
A fun and easy card! I was happily surprised at the results and how much I liked it! Want to snag your own vintage/retro natural card?? Let's set up a Private Class or join in one of my classes in the Conejo Valley! If you find larger/background stamps a challenge?? Use the side stamped that you don't like on the back! Cute! 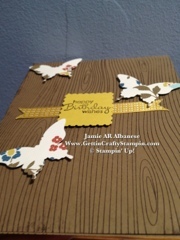 Popping the sentiment and an extra butterfly on the inside really allows for you to tie the theme in. 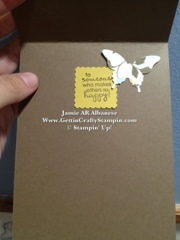 Placing a Summer Starfruit punched butterfly on the envelope sneaks a bit of fun in too!